Kumamoto Castle fly to: From above Japan, Fly over Kyushu, Kumamoto county, Kumamoto city, Kumamoto Castle, then from far to near, orbit two and a half round until the castle tower. From Hohoate Gate headed towards the main tour: “Hohoate Gate” is one of the four entrances, to navigate by Street View, direct to castle tower(天守閣 tenshukaku). Honmaru Goten Grand Hall: The biggest highlight of Kumamoto Castle recovery plan-“Honmaru Goten Grand Hall” was repaired completly on April 2008. The Grand Hall is the place of residence of feudal lord, there are 53 rooms then, including 25 rooms to be repaired. According to the painting, literature, old photographs of that time, and other historical Meiji period as the basis, the walls painting, ceiling paintings etc. were recovered, and then decorated with ornaments of that time, so that another luxury gorgeous scene show in front of us. This youtube show the indoor navigation via Google Street View, I will take everyone to visit. 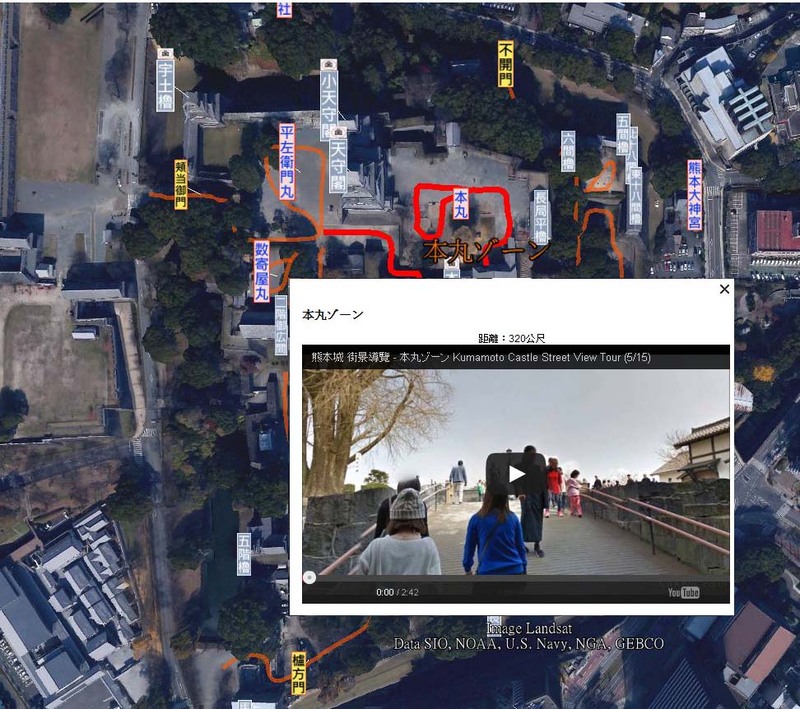 The above three Youtube is parts of the “Kumamoto Castle Street View Tour” outcome, I first display all towers, gates, and other landmarks as name icons, then go through four entrances of Kumamoto Castle (Hohoate Gate, Hazegata Gate,Sudoguchi Gate,Akazuno Gate), over all castle, and finally get fifteen street view routes. Then I convert these routes to street view tour by my “Street View Tour Generator“. On the leftside of Google Earth, you can play every street view tour (for unknown reasons, may not be able to enter Street View mode, if in this situation,then you can pull Pegman and put it at the beginning of the route, as soon as may be after entering the street mode, and then press “►” to continue to play), or on the right side of the Google Earth screen hover each route to see the info of each route, or click to see the Youtube that I prerecorded. 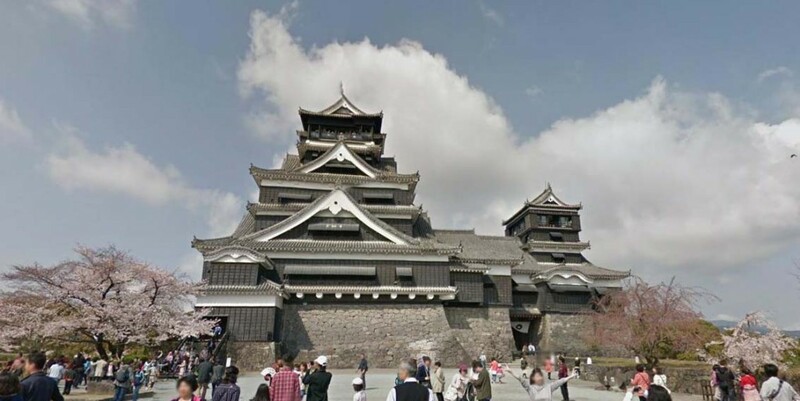 There are five indoor street view, including: Honmaru Goten Palace, the top floor of castle tower , the top floor of small castle tower, the corridor of Uto turret, the top floor of Uto turret. Since the indoor street view places by 2.5 meters on ground in Google Earth. 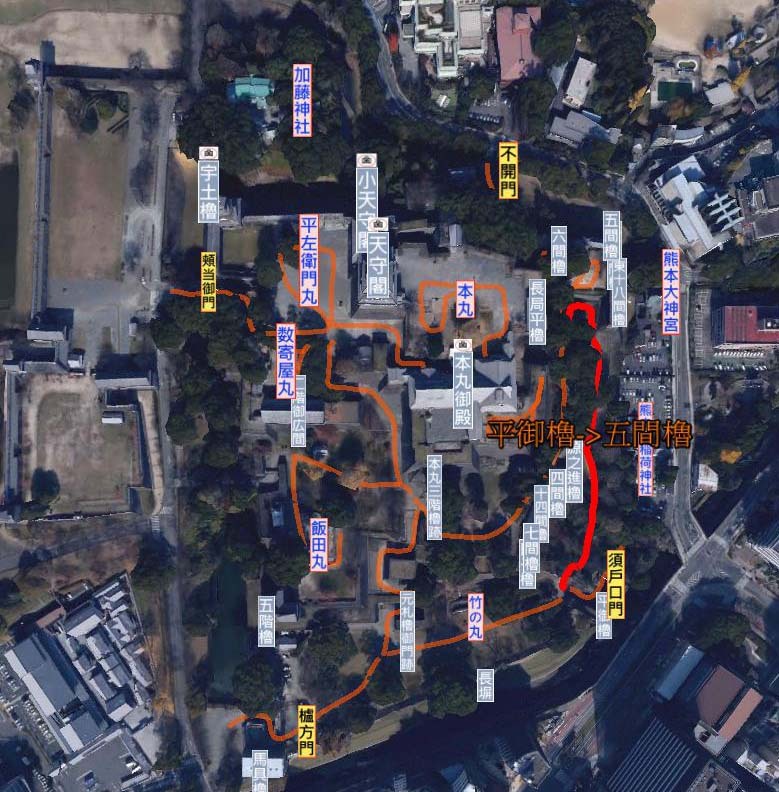 It’s the same way as general street view, if both are in adjacent positions, the general street view is mostly higher priority to enter Street View mode, so if you encounter these difficulties (Honmaru Goten Palace and the top floor of castle tower are maybe in this situation), you can click this five Landmarks ( on top of a icon) to watch the pre-recorded Youtube. This entry was posted in GE Application, Street View. Bookmark the permalink.